For most, the NFL Draft is an exciting time filled with joy. For some fringe roster players and placeholder starters, it is a time of finding out exactly where you stand with your current employer. And while our jobs may not be on the line, for fantasy players—especially those in dynasty and keeper leagues—some of our assets can gain or lose tremendous value during the 3-day extravaganza. Do you remember when the Steelers took Juju Smith-Schuster in the 2nd round and Martavis Bryant proclaimed that he was drafted to replace Sammie Coates, not Bryant? Well, as it turned out, Juju was there to replace them both and their fantasy value plummeted. Which players find themselves in that hot seat this year? Which players could use a dynamic playmaker like Smith-Schuster to help shoulder some of that defensive attention? I’m glad you asked. Now, clearly not all of the players I’m about to mention have to fear Mr. Barkley personally. But these running backs find themselves on teams that could certainly be looking to upgrade the position in late April. Be it with Barkley, one of the Georgia backs, or Derrius Guice, the following players could see their stock plummet come early May. C.J. Anderson: Whether it’s Barkley at 5 or one of the other guys in the early 2nd round, it’s just about assured that the Broncos will be taking an RB in this draft. Anderson has been surrounded by trade rumors all offseason and it seems he’s never really been very popular in Denver. Was he great last year? No, but he played all 16 games, finished with over 1000 yards, and ended the year as the RB17. If he were cut or put behind a rookie on the depth chart, his value would be non-existent. Lamar Miller / D’Onta Foreman: Another RB who is always seemingly the least popular guy in town is Lamar Miller. When he was was successful in Miami, we just kept hearing he couldn’t handle a full workload…and that seems to be the truth. In his 2 years in Houston, he has seen the most carries of his career and the worst YPC and TD numbers. Foreman looked primed to steal the job from his last season before a gruesome Achilles injury. Despite finishing as the RB16, Miller has had “soon to be cut” rumors around since the season wrapped and with the talent at RB in this draft it could be a dangerous combination for Miller’s job security. The good news is that the Texans don’t have a pick til the 3rd round. Jonathan Stewart: While Stewart is certainly not a popular pick in fantasy drafts, the starting RB job for Giants could provide some value and that role is his for now. There is a very real possibility that the Giants call Saquon’s name on draft day but even if they don’t, New York owns early picks in the 2nd and 3rd rounds. Stewart might find himself in a timeshare with a rookie for the 2nd straight year. 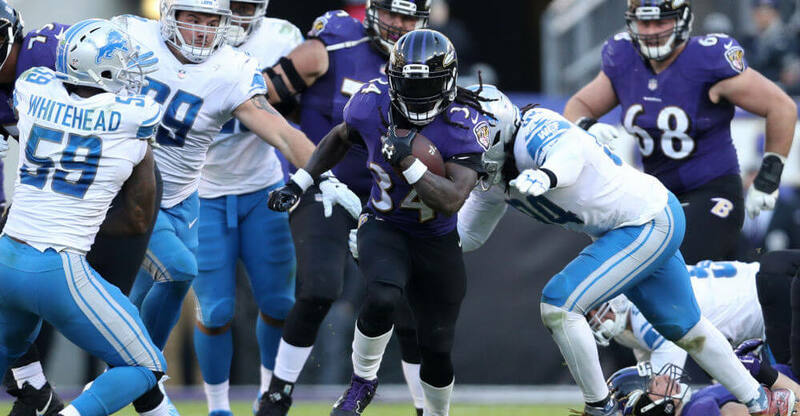 Alex Collins: Collins played well to end 2017, reaching double-digit fantasy points in 6 of the Ravens’ last 9 games. The Ravens have been retooling their offense all offseason and own the 16th and 52nd pick in the upcoming draft. The Ravens typically throw to their RBs more than any team in the league and that is not really Collins’ game. I would not be surprised to see them add someone in the 2nd round to fill their 3rd down back role and that will cut into Collins’ production that, while good enough to finish RB17, was aided by the fact that he was pretty much the only healthy horse in the stable. Marlon Mack: I don’t know that Mack has a ton of value to lose. Even after letting Frank Gore go, I can’t imagine there is much thought of Mack becoming a full-time back. He averaged less than 4 YPC last year and didn’t look all that impressive in his limited touches. The Colts could snag Barkley at 6 if Denver passes and would almost certainly grab an RB at 36 if they pass on Saquon. Mack seems more like a placeholder at this point. Carlos Hyde: Let me start by saying I don’t believe the Browns will go Barkley at 4. You’re already paying Hyde and still have Duke Johnson on the team, it doesn’t make sense for their roster. Should they take him…yes. I truly believe he is a game changer that might not come around for another 10 years. If they do pass on Barkley, Hyde is a prime spot on a re-tooled offense to end up as an RB1 in fantasy. If they take the Penn State phenom, we could see a committee that will drive fantasy owners crazy. Nobody has more to lose in fantasy value than Hyde, the only reason he’s not higher is I don’t think Cleveland will take Barkley. Not every player will be watching this draft hoping their team doesn’t replace them…some will be begging for help. There are a couple of potential fantasy studs that will be in trouble if their team doesn’t add some firepower over the 3 days of the draft. LeSean McCoy: Right now Shady has to be thinking he is a marked man in 2018. The Bills current QBs are famous for 5 interception halves and Hue Jackson trade flubs. Their current WRs are Kelvin Benjamin and not much else (all due respect to Zay Jones but he has bigger things to worry about than football right now). Shady may spend the majority of his season facing 8 and even 9 men in the box and that could put a strain on a 30-year-old RB. With multiple 1st round picks, they may want to add WR and complimentary back to take some weight off of McCoy‘s shoulders. Russell Wilson: With Jimmy Graham leaving town, Wilson lost a safety blanket and his biggest target. Doug Baldwin can only do so much and I don’t know if they have the right pieces on the roster right now to keep Russ effective. Not only does Tyler Lockett need to play at a more consistent level, the Seahawks need stars at RB and a big WR or TE for Wilson to look for when he’s in a tight spot. Wilson was the overall QB1 last year but may come crashing down if not given some help in this draft. 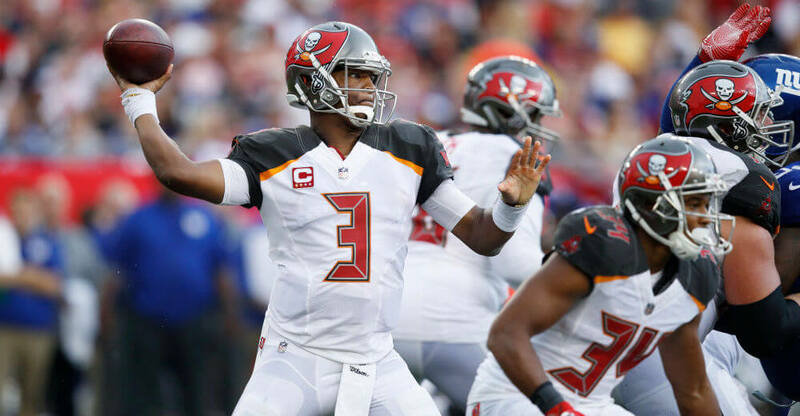 Jameis Winston: To put it simply, the Buccaneers need an RB. If Peyton Barber and Jacquizz Rodgers are all defenses have to worry about, it’s going to be a long year for Winston and the Tampa Bay pass catchers. Barber/Rodgers will not demand many stacked fronts and that is going to leave plenty of room for Mike Evans / Desean Jackson double teams and Jameis Winston mistakes…not a great fantasy combination. Let’s hope these guys embrace a new teammate better than Bryant did, but make no mistake about it: if Calvin Ridley, DJ Moore or any of the other rookie WRs come to town, these guys will be seeing far fewer targets and much less fantasy value. PSA: Check out Matt Harmon’s excellent Reception Perception series on the rookie pass catchers who will be stealing these jobs soon! Robby Anderson: Offseason arrests, the return of Quincy Enunwa, and the addition of Terrelle Pryor have already taken a chunk out of the hype that his top 20 season last year built for Anderson. If the Jets were to grab a WR early in the 3rd to pair with their likely new rookie QB, Anderson could go from borderline WR1 to unemployed. JJ Nelson: Nelson started 2017 just like he ended 2016: HOT! But after 2 TDs in the first 2 games, he scored zero the rest of the year. Larry Fitzgerald is nearing the end and there is no indication that Chad Williams or Brice Butler are ready to take a big step. With the 15th pick in both the 1st and 2nd rounds, the Cardinals may find themselves in a prime spot to find their next #1. Ted Ginn Jr: I’m writing this article before the Bears make a decision on whether or not they will let Cam Meredith sign with the Saints, so Ginn’s value may already plummet before the draft even starts but it’s clear the Saints are looking for an upgrade. Ginn was a top 40 WR last year but could be relegated back to punt return duty if the Saints draft a wideout. Randall Cobb / Geronimo Allison: The #2 spot in Green Bay is as valuable as any in the NFL. Cobb has been a consistent let down the last couple of years and Allison hasn’t really shown much yet. With the exit of Jordy Nelson and owning the 14th pick of the draft, Green Bay might be a perfect landing spot for one the top rookie WRs to make an immediate impact.